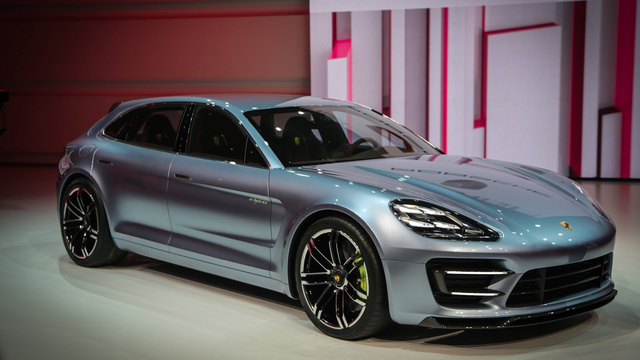 Porsche revealed the Panamera Sport Turismo concept at Paris Motor Show .The plug-in hybrid model is described by Porsche as little more than a concept, but the company will be gauging public reaction at the show to see whether an estate version of the Panamera could be added to the range in the future. This new concept then, gets an uprated electric motor worth 95bhp - twice the power of the current Porsche hybrid drive motor - allied to a supercharged 3.0-litre V6 engine (still churning out 333bhp) to make maximum merriment of 416bhp. As such, deploy both electric and analogue horses, and you'll accelerate from 0-62mph in less than six seconds, all driven through the rear wheels alone. But, you'll be able to drive up to a maximum of 80mph for around 18 miles using just that 95bhp electric motor alone. You don't need an engineering degree to work out that this source equals zero emissions while driving, and helps overall CO2 output sit at less than 82g/km. That's 416bhp and 0-62mph in sub six with a lower carbon footprint than a ruddy Volkswagen Up BlueMotion. It's got a longer roofline than the standard Panamera and a more abrupt rear end, helping to increase boot space. The Sport Turismo also previews a few of the design cues that will find their way on to the revised Panamera early next year. The front end is now far more sculpted, with sharp creases on the bonnet, reshaped headlights and a much larger grille. The interior is recognizable from the current car, with its prominent rising centre console, but everything has been simplified. There are fewer buttons and a new LCD screen in the dash, which replaces the traditional dials in the current car. All this is thanks to that dandy new battery, a lithium-ion unit that's the same size as the nickel-hydride one currently in use, but packs a higher peak power. Its default setting is electric, and utilising that s‘charged V6 requires pressing a button on the steering wheel. In turn, that V6 helps charge the battery through ‘load point shifting', although you can simply plug it into any wall charger (AC) and power up in just 2.5 hours. Naturally, it's a concept, and so there are some very concept-y details included: there are cameras mounted where the door mirrors should be, there's a 3D Porsche badge, a ‘liquid metal blue' hue that should send anyone called Sarah Connor into a cold panic, a TFT colour screen in place of regular dials, two monitors showing those exterior mirror camera images, hybrid-drive displays, a power meter and mobile phone connectivity. Porsche tells us you can even use your phone to ‘precondition' the car - setting up the air con, for example, before you get in. The Acid Green colour used for the brake calipers and the Sport Turismo badge are set to become trademark features of Porsche's performance hybrids.